Tag Archive | "Agassiz’s Dwarf Cichlid"
The Agassiz’s Dwarf Cichlid (Apistogramma agassizii) is found in the Amazon River basin from Peru to the Capim River Basin and is also known as Agassiz’s Apisto by tropical fish keeping enthusiasts. Agassiz’s Dwarf Cichlids inhabit the clear, still or slow moving, leaf littered black and white water creeks of their geographic area, and feed mostly on benthic invertebrates that are found among the litter. The Agassiz’s Dwarf Cichlid is a small colorful fish that only grows to about 3 1/2″. Their colors are dependent on where they are caught in the wild, but males are always more colorful and larger than the females. 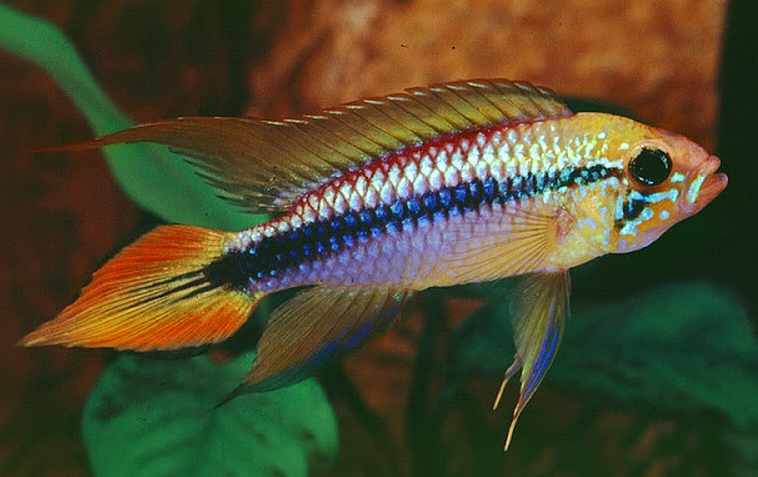 Red, gold and blue color varieties of Apistogramma agassizii are collected from different geographical areas and are more colorful than captive bred specimens however, they are more sensitive to disease and more difficult to keep in an aquarium environment. Breeding captive bred species with wild strains significantly improves their health and overall line. The Male Agassiz’s Dwarf Cichlid’s upper back is red, and the lower back is green with a horizontal black band that runs from their nose up to their caudal fin, parallel to the green lower back. The color below the black band can vary from blue, to yellow, to green but their bellies are usually yellow. The forehead is primarily yellow with gold or green marks. Their dorsal fins are an orange reddish color with sharp points at the end, their caudal fin has white, blue, to light blue lines with pointed ends, and their other fins are blue to green. The female Agassiz’s Dwarf Cichlid is less colorful than the male and lacks the long fins. Their coloring is similar to the males but predominately yellow with similar body markings. Agassiz’s Dwarf Cichlid is a community fish that is tolerant of their own kind. They are best kept in small harems of one male with 3 or 4 females. 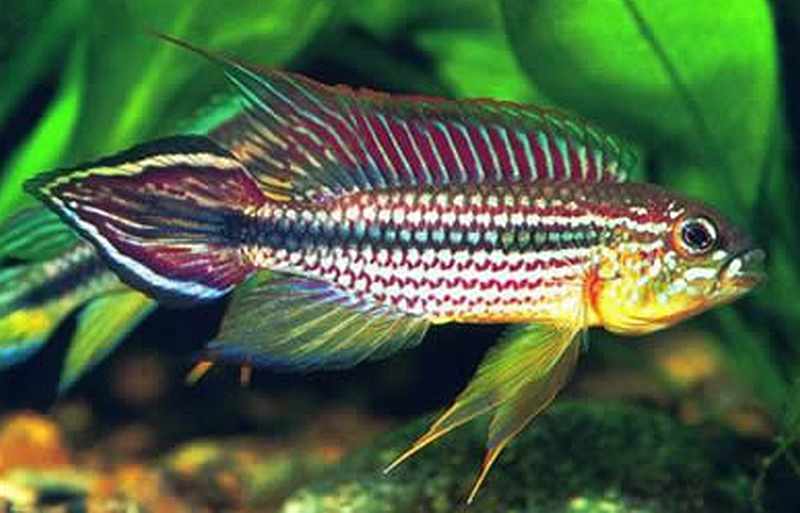 As a community fish, they can be housed with any similar sized, non aggressive species such as Cardinal Tetras, Corydoras, Glowlight Rasboras, Dwarf Gouramis, Otocinclus Catfish, Threelined Pencilfish, Rainbowfish, Kuhli Loachs, etc. Agassiz’s Dwarf Cichlids are best kept in a moderately lit, densely planted 30 gallon or larger “black water” tank with a sand or fine gravel substrate, some worn river rocks, caves, driftwood and some leaves on the bottom to mimic their natural environment. Floating plants are recommended to diffuse lighting as well as dense plantings of Vallisneria, Wisteria or other acid water loving plants like Amazon Sword plants. These cichlids prefer well filtered, slow moving, soft and slightly acidic water conditions, and because they are highly susceptible to nitrates, should only be introduced into mature aquariums. 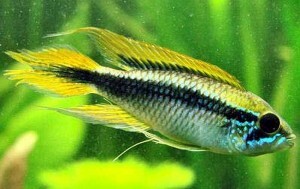 Agassizi Cichlids are relatively easy to breed. The best way to breed these cichlids is to acquire 6 juveniles and allow them to grow up together. When they reach breeding size they will form a harem of one dominant male and several females. They are polygamous cave breeders and will generally lay between 40 and 150 oval eggs on the ceiling of the cave, flower pot, bogwood, or broad leafed plant. The harems of multiple females will defend each of their small territories from every other fish except the dominant male. After fertilizing the eggs, the male promptly leaves the cave and lets the female care for the eggs while he guards the territory around the cave. Depending on water temperature, the eggs will hatch out in 3 to 4 days. The female will then heard the fry into a pit in the substrate for approximately 4 to 6 days, until they are free swimming. When the fry are totally free swimming, the female will lead them around the tank in a small school. The fry should be fed rotifers, infusoria and liquid food for the first week or so, and then newly hatched baby brine shrimp three times a day until they are able to eat crushed flake food and larger fare on their own. For breeding, a temperature of 79° to 84° F, a pH of 6.0 to 6.5, and a water hardness of 5 – 8 dH will give you the best results. If you keep the water temperature consistently low (68° F) for the first three weeks, most of the fry will be females and if you keep a consistently higher water temperature (86°) the fry will be mostly male. The eggs are susceptible to fungus but the addition of peat or Indian Almond Leaves to the tank will help prevent fungus problems. Although Agassiz’s Dwarf Cichlids are classified as omnivores, in the wild they are mainly carnivorous feeding on benthic invertebrates. In an aquarium environment they can be fed live or frozen brine shrimp , insect larvae, small insects, daphnia , and a high quality flake or pelleted food. Feed them small pinches several times a day instead of a single large feeding to keep the water quality higher for a longer period of time. Agassiz’s Dwarf Cichlids are somewhat rare in tropical fish shops but can be purchased online or from breeders if you don’t mind waiting for them. When available they are moderately expensive and approximately 1″ to 1-1/2″ in length.